To get the answer to the question one merely has to start looking at some numbers. With an estimated 44% of the energy used in South African households being diverted, to heating and cooling. One soon realises that any way to save energy is worthwhile. The next question to ask is “is roofing insulation worthwhile?” And again the answer is “yes”. Insulation in any home, not just roofing insulation has been proven to save a lot of energy. By saving a lot of energy bills come down from 10% to 50%. And that saving alone makes insulation more than worthwhile. Roof insulation, of course, plays a part in reducing energy consumption. But How Does Roofing Insulation Work? Roofing Insulation is natural; it is not a device you switch on or switch off. However, insulation is a way to control the natural tendency for warm air to go looking for colder air. 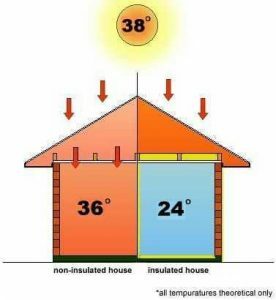 Insulation is a barrier between hot and cold air that works in two ways. Firstly Roofing insulation works in winter where cold outside air is prevented from entering a room or building. Secondly, in the warmer summer month’s Ceiling, insulation stops warm air from entering thus keeping ambient temperatures lower. Basically, insulation keeps air temperature stable in the home at more comfortable levels. Making a home more comfortable in winter and summer. The controlled temperature reduces the need for heaters to be switched on to full blast in winter and reversed in summer. With air conditioning units. Insulation once installed correctly sits where it does, costing nothing and saving homeowners money. What Types of Roofing Insulation Are There? In broad terms, there are two types of insulation: Solar film or bulk insulation. Both are different, and both can be used together to provide adequate insulation of a room, house or an entire office block. Bulk Insulation is what many people are thinking of when they ask “is roofing insulation effective?” in South Africa. Bulk insulation is not just used in roof spaces and is a vastly more versatile insulation product. Generally manufactured using fibreglass mineral wool – Rockwool for example – other synthetic fibres or real sheep wool. Bulk insulation is available in a variety of formats. Insulation Blankets are conventional and the insulation material comes in long rolls that can be trimmed or cut to size. Bulk insulation is also available in rolls that can be cut to size. Bulk insulation works because of its high R-Value. Often thick and very dense, bulk insulation is a poor conductor of heat as measured by the R-value. 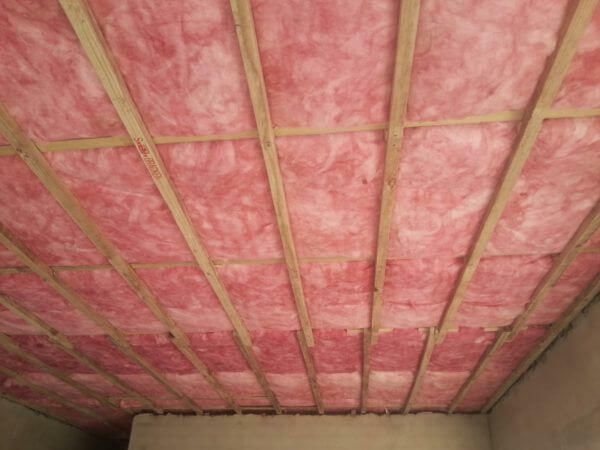 The higher the R-Value of an insulation product, the better at trapping heat. Not allowing it to pass through the material it is. With a higher R-Value better insulation should be possible; however, some materials are more suited to certain conditions than others because they are easier to install for example. Bulk insulation traps air particles and the better at doing this a particular product is the better its thermal resistance is. This means that different products have different capabilities and thus have higher or lower R values. Many homes use a variety of bulk insulation products and therefore have a combination of R values. It needs to be said that R-values are cumulative and some areas, of course, will be warmer or colder due to some reasons. The total R-Value for your home will be determined by the number of and types of insulation you have chosen to install. All roof insulation must be SANS compliant in South Africa. What Will Insulation Work For You? Basement or slab – the foundations of a property influence the type of insulation fitted. Roof type – “is roof insulation effective?” – To fully determine the effectiveness of insulation the type of roof your home has makes a big difference. Flat roofs, tiled roofs, corrugated metal roofs, thatch and even the angle of the slope of your roof all play a part in the insulation properties of your home. Installing insulation is not just about putting any insulation in and hoping for a good result. Yes, some insulation is better than none, but the wrong R-value can make a house warm and cosy in winter but leave it like an oven in summer. Getting insulation right is essential for years of energy saving. The intention of insulation, is to bring long-term savings and this saving comes from reducing energy used in the home. A simple energy audit makes a difference to how and where to insulate. Checking all the potential energy loss areas can start with just a walkthrough of your home, some things will stand out. But for those taking insulation seriously, it is worthwhile having a professional energy audit and inspection done. The professional audit will pay off, not only will it allow issues to be fixed or old, energy draining appliances to be replaced, it will provide the information needed to insulate and make the most significant savings optimally. With the right information at hand, the right decisions around insulation can be made. Your appliances will run more efficiently, your home will be more comfortable, and your energy bills will drop. Better insulation also means you are playing your part to help the environment, but you can go one step further. By using less energy in your insulated home, you are now environmentally more friendly, and there is a way to take this even further. There are now a variety of eco-friendly insulation products that use natural or recycled materials. Insulation products made from flax, hemp, cellulose, sheep’s wool and now recycled plastic bottles go a long way in protecting the planet. ISOTHERM is one of the best examples of eco-friendly insulation made from recycled plastic bottles. ISOTHERM also promotes passive temperature control by insulating a wide variety of places in your home. Going green has never been easier, and insulating your home with ISOTHERM will also bring those long-term cash savings everyone needs. Make sure to check the insulation specifications to get the correct thickness of insulation. The Think Pink Aerolite is also regarded as an eco-friendly roofing insulation. Aerolite is manufactured from recycled glass bottles. The 135mm Aerolite is the flagship of the Aerolite brand. For more info and to make sure you select the correct insulation specifications.